Ex-England football international Alan Ball MBE is to auction off his 1966 World Cup winners' medal to raise money for his children and grandchildren. 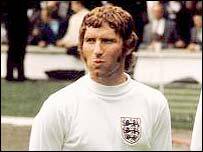 As the youngest member of the 1966 team at 21, he set up the third goal in the 4-2 final win against West Germany, England's only World Cup triumph. Hampshire-based Ball, who won 72 English caps, hopes to raise £120,000. "My wife passed away a year ago and my priorities have changed," said the Bolton-born star. "I have three children and three grandchildren, and the most important thing for me is to make sure they are looked after as well as possible." While football stars can now command multi-million pound annual salaries and sponsorship deals, past stars have had to sell off memorabilia to make ends meet. Ball's England team-mates goalkeeper Gordon Banks and goalscorer Geoff Hurst have both sold off their World Cup winners' medals and shirts. The 60-year-old former Blackpool and Everton midfielder, who managed several clubs including Manchester City and Southampton, also hopes to raise £25,000 from the sale of his World Cup final cap and nearly £8,000 from the sale of two other medals at Christie's in London on 19 May. "Winning the World Cup in 1966 will stay with me forever, but it's time to look to the future, not the past," he said in a statement. The oldest existing FA Cup will also be in the auction. It has been described as arguably the most important item of football history to be offered for sale and its estimated price has been put at up to £300,000.